True North Leadership does not take a one-size fits all approach to leadership training. While there are common themes and focuses relative to leadership training, we lean into building a custom approach based on the particular needs of an organization. TNLG faculty speak at large “onstage” leadership gatherings and company events on a wide range of topics. Send in a request form for a menu of subject matters, and a request for custom talks. BENCHMARKS® – A comprehensive 360-degree assessment for middle to upper managers that measures 16 competencies critical for success, as well as five possible career derailers. EXECUTIVE DIMENSIONS® Addresses the specific leadership challenges faced by executives at the top levels in the organization. These challenges can differ from a great deal from those at the middle management level. PROSPECTOR® provides feedback in two areas of behavior: the skills most often found in successful leaders, and the learning behaviors needed to acquire those skills. Prospector can be used with high-potentials, individual contributor, and managers. SKILLSCOPE® is a 360-degree assessment that provides individuals with straightforward, practical feedback on job related skills necessary for effectiveness in a management role. SKILLSCOPE’s simplicity also makes it an ideal first step for organizations that are new to the 360- degree assessment process. Teamwork is the ultimate competitive advantage because it is so powerful and so rare. A high-functioning team can achieve its potential, resulting in a healthier, more productive organization. Additionally, improving teamwork is an important endeavor beyond merely helping organizations become more effective. It also reduces stress and dissatisfaction of the people who work in those organizations, which has a profound impact on the lives of their friends and family members as well. The Five Behaviors of a Cohesive Team assessment gives team members a sense of their team’s unique strengths and areas of improvement. It’s a tool that evaluates the team’s dynamic across the five fundamental behaviors so members can decide what improvements are necessary for becoming a higher performing team. The assessment also serves as a powerful measurement for growth. By first taking the assessment at the outset of the development effort, the team will establish a baseline for the current state. Then – after the team learns and practices new skills – taking a re-assessment will provide valuable feedback about where the team is progressing and about where more focus must be placed. The Five Behaviors of a Cohesive team includes a DiSC behavior-style assessment for each team member, with the results presented on a single graph that plots the personality and behavioral “style” (Dominance, Influence, Steadiness and Conscientiousness) of everyone on the team. Personality and behavioral style is a key determinant for how people present themselves and interpret the words and actions of others. Gaining a better understanding and greater appreciation of each team member’s style gives the team as a whole the ability to work together more effectively. Here is author of The Five Dysfunctions of a Team: A Leadership Fable discussing how the 5 behaviors of a cohesive team came about. 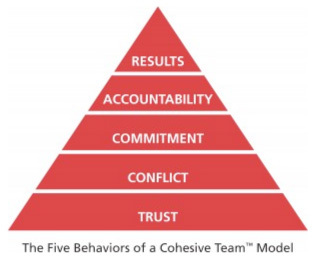 Do you want to find out more about THE FIVE BEHAVIORS OF A COHESIVE TEAM and how it can help you in your business? Find out how The North Group can help.